With so many fall festivals, vintage markets and craft shows coming up I've been busy making fall decor pieces. 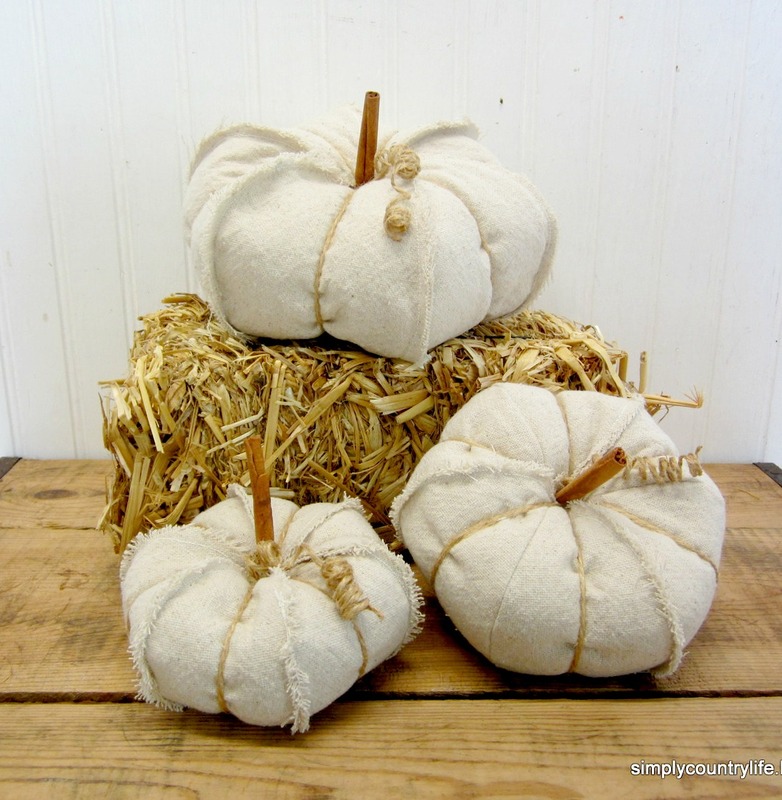 I wanted to share these cute drop cloth pumpkins and how I made them. I started out by cutting a pattern out of a manilla folder. The pattern is shaped kindof like a leaf or football. 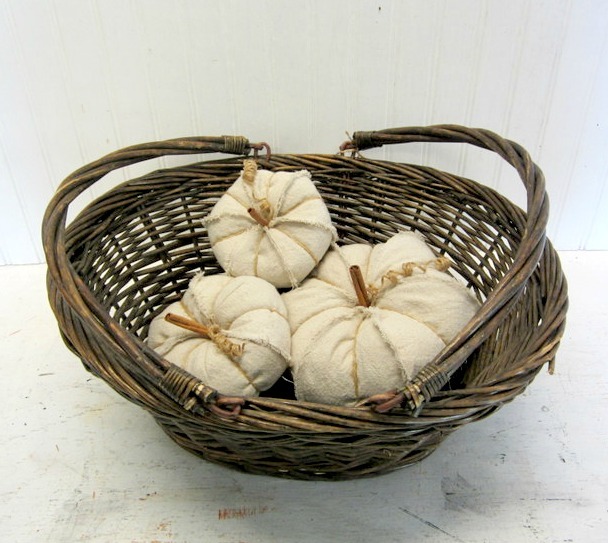 The largest pumpkin pattern is 7" by 3"
The medium pumpkin pattern is 6" by 2.5"
and the smallest pumpkin pattern is 5" by 2"
Using the pattern, I cut 6 pieces of drop cloth for each pumpkin. and repeated that on the other 2 pairs. and repeated this until all of the pieces were connected. Remember to leave a little section open on one end so that you can stuff the pumpkin. but not so big that you'll have to hand stitch it closed later. so that I could stuff small pieces of polyfil into the pumpkin with one finger. You can turn the pumpkin inside out if you do not want the frayed edges showing. I like the frayed edges, so I left them on the outside. I stuffed the pumpkin with polyfil through the small opening I left on the top. Then I used a large needle and jute twine to create the sections on the pumpkin. and repeated this in each section. I left a long tail of twine coming out of the top of the pumpkin. I used this to create the curly-Q. Then I wrapped the twine around the pencil and taped the top edge of it to hold it onto the pencil. Then I applied a light coat of Mod Podge over the twine with a foam brush and let it dry. The next day, I removed the tape and carefully loosened the twine from the pencil by twisting the pencil and then carefully pulling the pencil out of the curl. and I also glued a faux pumpkin leaf onto the largest pumpkin. You will probably need to trim the excess twine off of the knot on the bottom of the pumpkin and also trim up your curly-Q some. The hot glue and decorations should fill in the opening on the top that you used to stuff the pumpkin. If not, you may want to hand stitch a couple stitches to close the opening. I like the neutral, rustic look of the drop cloth and twine, but there are a lot of options with these. - make the pattern longer and wider to make a taller, bigger pumpkin - use a piece of branch instead of a cinnamon stick as the stem - add moss or raffia instead of the curly-Q - use different fabric I also thought they would make sentimental memories by making them out of fabric from a piece of clothing that your child has outgrown or from clothing from a loved one. I do plan to make a few variations of these myself. What about you, what would you do differently if you were making them? Thank you. Sounds like your pumpkins got the best approval possible! Thank you Cecilia. I love decorating with neutrals too. I love the way you made these and the only change I would do is to sew a different patterned fabric on every other one. So cute and this will be my project this week, Thanks Anne. Thank you Anne, and yes different fabrics would look super cute! Thanks for the great tutorial on making these. Their neutral color can be moved from room to room and they look like those white French pumpkins which I like the best. Only these would last longer. These are so great! They remind me of my first sewing project, 30 years ago! One of my friend's moms taught some of us how to sew after school, and pumpkins were our first project. I wonder if my mom still has it. Still, I love these white ones, I hope I have some time to make some this year!!! I really like the exposed seams, and the cinnamon stick stems are brilliant! What great memories! How neat if she still has it. Happy Fall! Hi Laura, thank you and so glad to have you stop by. I hope the tutorial isn't too confusing. Have fun crafting. Your pumpkins are absolutely adorable! And I love that they are white. I don't decorate with orange so I love to see white pumpkins. You've inspired me to make my own!